Chicken is known to be the star of many popular cuisines all over the world. It’s such a versatile meat, you can basically cook and enjoy it in any form, from butter chicken to tandoori-style to chicken chettinad, and so very much more. Not only does it taste delightfully good in a number of ways – it also offers many health benefits! It’s an excellent source of protein. Of 100 grams of chicken, 31 grams are proteins! Protein helps in maintaining body weight, keeping you full and less prone to binge eating. High protein can also give you that energy boost to achieve a muscular and toned body. Moreover, it gives zinc, iron and lots of vitamins such as Vitamin B6, B12 and D.
Chicken provides selenium, which increases metabolic performance and contains antioxidants that strengthen and improve your immune system. It’s rich in Niacin. This particular B-vitamin is known for its anti-cancer properties while also guarding the body against other genetic complications. It contains nutrients that are good for your eyes. Chicken composes of retinol, lycopene, alpha, beta-carotene, etc. – all of which are essential to protect and maintain the health of your eyes. The white meat contains a high content of riboflavin. Dry, peeling, or cracking of the skin indicates cell and tissue damage due to mineral and vitamin deficiency. Consuming breast meat rich in riboflavin can help aid the growth of cells and tissues. These are just a few of the many nutritional benefits that the meat from a chicken offers. The best part is throwing in the right herbs and spices to make it even healthier! Cumin, which promotes digestion and reduces food-borne infections. Coriander (also called cilantro), which improves bone health and lowers cholesterol. Turmeric, which treats inflammatory conditions and relieves pain. Cinnamon, which lowers blood sugar and protects your body from oxidative damage. Garlic, which combats sickness like the common cold and reduces blood pressure. Ginger, which relieves nausea and alleviates muscle pain. … and more (but of course, that’s top secret). 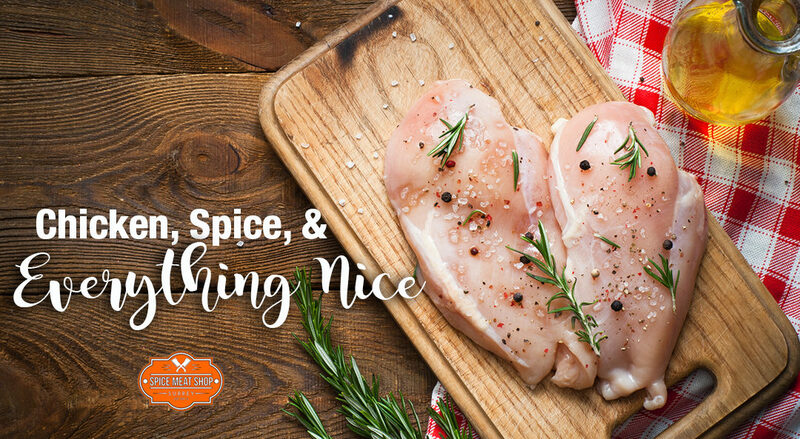 The process of marinating chicken cuts requires a lot of patience as there are specific times when certain herbs and spices are added to ensure maximum flavour. Having to wait for hours for the marinade to absorb properly only means you’re getting the best and most flavourful meat possible, and that’s perfect for your Indian dish. Poultry recipes are endless, but always keep in mind that, like most things, it should be consumed in the right quantities. Choosing high grade meat, marinated in the right mix of herbs and spices will surely be a delightful and healthy gastronomic experience!